A PROMISE to help the fastest moving coal mine developers secure land for rail lines is sending waves of concern through Central Queensland, with fears the vow will derail negotiations between farmers and multinational miners. On Thursday, the Queensland Government pledged a hamper of bonuses to whichever company is the "first mover" to dig into the Galilee Basin coalfields west of Rockhampton. Indian giant GVK Hancock - which is building the $6.4 billion Alpha coal project with billionaire magnate Gina Rinehart - and its home-town rival Adani are tipped to be neck-and-neck. One of these sweeteners is an assurance that land needed for a 500km rail link from the Galilee to Abbot Point north of Bowen would be "acquired" by the state to help mining companies score funding for their projects. According to documents handed to the government by both Adani and GVK, each company's proposed rail line would cross at least 50 properties. 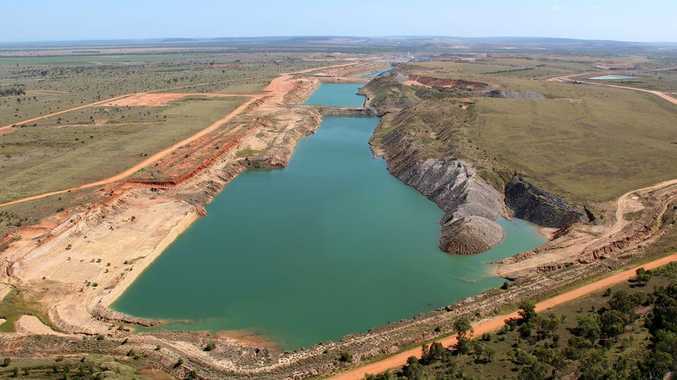 Affected landholders are already in discussion with mining companies, although much of this is being done under strict confidentiality agreements. Paola Cassoni owns the Glen Innes station in the Galilee Basin and was part of a Land Court challenge against the GVK Hancock's Alpha. Although her land is not affected the rail infrastructure, she said the State Government deal undermined any negotiations between land owners and mining companies. "Those (negotiations), you can't fast track them," she said. "You have to go through it with a fine toothcomb and have a proper compensation agreement with equal footing. "With what the Newman Government has done, (landholders) don't have it." On Thursday, Deputy Premier Jeff Seeney said the worry of property owners was not lost on him, but such a deal with miners was critical. "This area of Queensland is sparsely populated, the areas are very large and the number of owners is relatively small," Mr Seeney said. "This does not take away from the impact these projects have on private landholders. "I more than anybody else have been a champion of individual property rights." The Galilee Basin is forecast to create up to 28,000 jobs - 15,000 of those in construction alone.